At an age when many new graduates are thinking about their first job, 18-year-old Mark Jang is already well on his way to a culinary career. 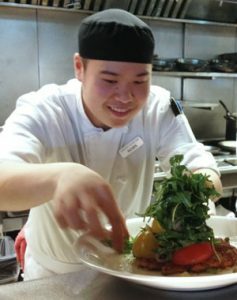 After less than two years with the Cactus Club Cafe, Jang, a newly qualified Professional Cook 2 (PC2), is a Junior Sous Chef and a Shift Leader, supervising eight line cooks at the popular chain’s busy Richmond location. Jang started at the Cactus Club through the ACE IT (Accelerated Credit Enrolment in Industry Training) program at Vancouver’s Sir Charles Tupper Secondary School. Through the program, which enables high school students to start apprenticeships, the aspiring chef qualified as a Professional Cook 1 (PC1) just weeks after his 2013 graduation. This year, after his six-week PC2 technical training at Vancouver Community College plus an additional 1,000 hours at the Cactus Club, Jang is now a certified PC2 and a valuable player on the restaurant’s kitchen team. That leadership ability is a key difference between PC1s and PC2s, observes Jang’s employer, Cactus Club’s Senior Chef, Phill Mudge. PC2s can, and that level of consistency makes them invaluable in any kitchen. Top management at the Cactus Club Restaurants recognizes this. Named one of the Platinum Club of Canada’s best managed companies for seven years running, the fast-growing 25-location chain is BC’s biggest employer of culinary apprentices. Jang, for example, is in for the long haul. “I’m almost a Sous Chef now. My next step is to gain more experience, train a bit more, and then complete my PC3 and become a Red Seal Chef,” he says. A restaurant environment, with its constant change and high-energy vibe, isn’t for everyone, but passionate cooks like Jang wouldn’t have it any other way.